Folding feature on both the chair and side table allows for easy storage and portability. This Adirondack Chair, with simple design, is a great piece of furniture to relax and enjoy your leisure time, in your yard, patio or balcony with your friends and family. This chair is made of Faux Wood more durable than traditional wood low maintenance and easy to clean. Compared to traditional wood it will not warp, splinter or rot. Varnishing and painting will never be needed. It is also foldable it can easily be folded-compact enough to use very little storage space creating more space, as needed. Investing in a few comfortable and low maintenance chair, will make your outdoor living space beautiful, comfortable and carefree more time to relax or entertain a worthy investment. Maintenance Free! The attractive Island Retreat Adirondack Chair features traditional styling and built-in comfort. The wide arm rests, curved seat, and ergonomically designed high back makes this chair and extremely pleasurable place to lounge. It is crafted from polyresin lumber that is engineered to withstand nature's elements. 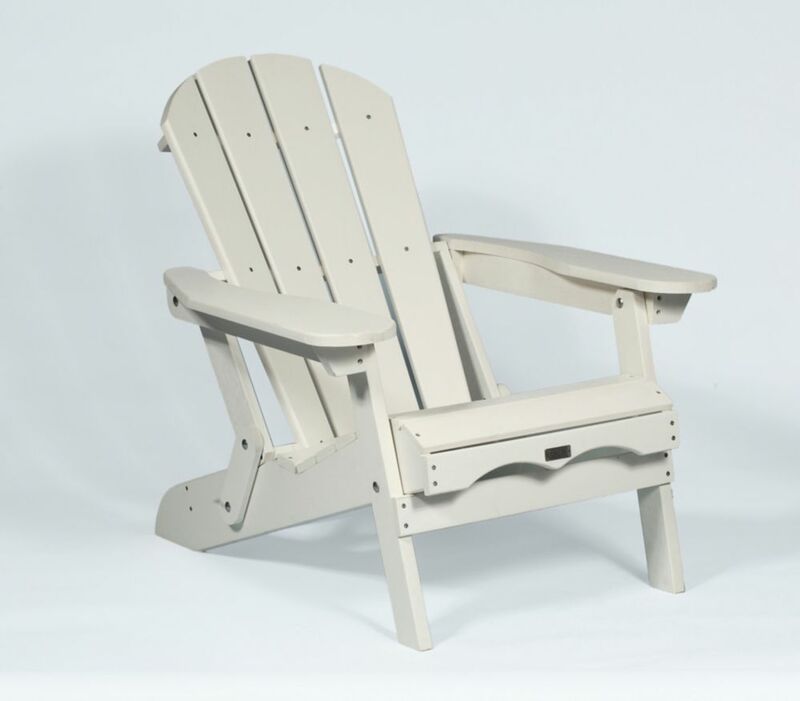 Available in a fade-resistant, bold White color that gives the appearance of painted wood, this Adirondack requires no painting, staining, waterproofing or similar upkeep. Easy to clean with soap and water. Kick back and relax in the comfort and styling youve come to expect with the Island Retreat line of products! Muskoka Folding Chair in White The Eon Adirondack Collection truly delivers lasting natural beauty. Crafted from an innovative all-season resin that boasts incredible fading and weathering performance, Eon's premium products maintain their beautiful, natural wood-like appearance over their very long lives. Eon technology eliminates the frustrations associated with sanding, staining and painting. Eon is one of the finest alternatives to wood available on the market today. This beautiful Adirondack collection is comfortable and durable and designed for easy assembly. To further compliment these beautiful Adirondack chairs, Eon also offers a matching side table and ottoman. Available in 3 amazing finishes: Cedar, Grey and White. Muskoka Folding Chair in White is rated 1.0 out of 5 by 1. Rated 1 out of 5 by Jules123 from Nice chair not 500$ nice Here we go with Home Depots insane pricing. No outdoor seating under 200$ unreal.